Rosacea is a common disorder that mainly affects facial skin. It causes redness on the nose, chin, cheeks, and forehead. Over time, the redness can become more intense, taking on a ruddy appearance. Superficial blood vessels may become visible. In some cases, rosacea appears on the chest, ears, neck, or scalp. Red solid bumps and pus-filled pimples can sometimes develop. The disorder can cause the nose to take on a bulbous, swollen appearance called rhinophyma. Rosacea can affect the eyes, causing them to feel irritated and to appear bloodshot or watery. Rosacea affects an estimated 14 million Americans. Most of them don’t know they have it. Flushing — Many people who have rosacea have a history of frequent blushing or flushing. The facial redness, which might come and go, often is the earliest sign of the disorder. Persistent redness — Persistent facial redness might resemble a blush or sunburn that does not go away. Bumps and pimples — Small red solid bumps or pus-filled pimples often develop. Sometimes the bumps might resemble acne, but blackheads are absent. Burning or stinging might be present. Visible blood vessels — Small blood vessels become visible on the skin of many people who have rosacea. Eye irritation — The eyes might be irritated, and appear watery or bloodshot in some people with rosacea. This condition, called ocular rosacea, can also cause styes as well as redness and swelling of the eyelids. Severe cases, if left untreated, can result in corneal damage and vision loss. Burning or stinging — Burning or stinging sensations might occur on the face, and itchiness or a feeling of tightness might also develop. Dry appearance — The central facial skin might be rough, and thus appear to be very dry. Plaques — Raised red patches (plaques) might develop without changes in the surrounding skin. 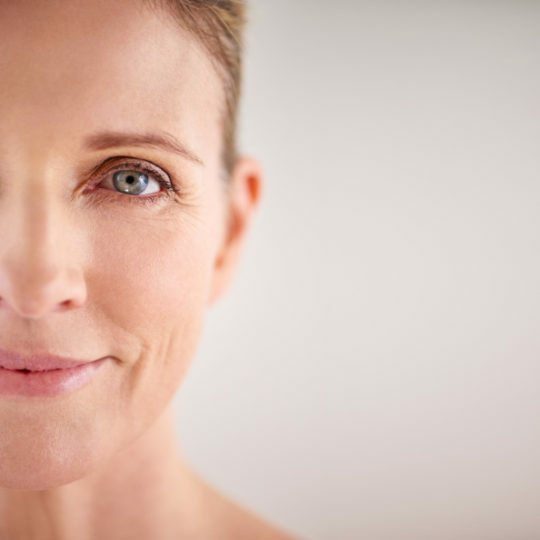 Skin thickening — In some cases of rosacea, the skin of the nose might thicken and enlarge from overgrowth of oil glands, resulting in a condition called rhinophyma. This condition causes the nose to to have a bulbous appearance. Swelling — Facial swelling (edema) can occur independently or can accompany other signs of rosacea. Signs beyond the face — Signs and symptoms might develop beyond the face, affecting areas including the neck, chest, scalp, or ears.